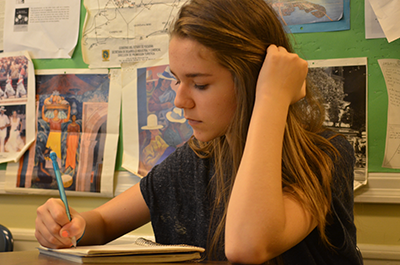 An individualized college preparatory program at The Beekman School is designed to set each college-bound student on a path to success. On average, 98 percent of Beekman graduates attend college! This record speaks to the commitment of our students, faculty, and school community. Our college prep programs provide students with the opportunity to benefit from a robust curriculum, personalized instruction, dedicated tutoring, standardized test support, and in-depth college counseling. We offer a private high school education in New York that can meet the unique needs of students who are interested in a wide range of careers. From their freshman to their senior years, students at Beekman prepare for college and receive ongoing academic advising. They can enroll in honors and college-level courses to jump-start a degree plan. Our faculty is dedicated to offering juniors and seniors the tools they need to excel in challenging, college-prep coursework. In addition, our college guidance counselor provides one-on-one assistance in applying to colleges that best match a student’s expectations. Throughout this journey, parents are actively involved. Enrolling in the Beekman School is an important step in preparing for your higher education and future. We guide students along the college track by inspiring their academic achievement. Our college prep programs for high school students also encourage participation in hobbies, extracurricular activities, college tours, and volunteer projects. We develop individualized learning plans for students that help them work to their full potential – completing courses to not only graduate, but also enroll in a college or university that complements their goals. Are you interested in learning more about college preparatory programs built around student interests? We invite you to contact our private high school today for more information.